Easily track all computer/internet activities and captures screenshots (print-screen) of system screen at regular interval of time in hidden mode. Records clipboard (copy-paste) activities performed by users. Invisibly log system sound activities and Voice Chat conversations. Record logs of typed website url’s, internet cookies, temporary files and other internet activities on your PC along with date and time details. Records complete system information (on/off, date/time, user login, computer name). Records information of applications that run on the PC when you are away. Securely record and save all user PC activities in protected log file without getting known by current user. Hidden and fully password protected utility to restrict external users from modifying software configuration settings. Easily generate reports of system and internet activities in either txt or html file format. 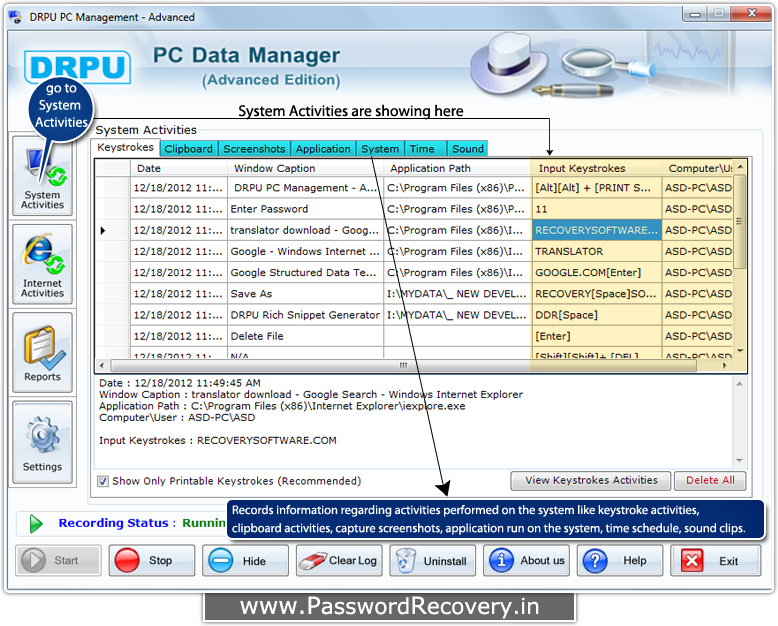 Facilitates users to take backup of recorded logs for further reference. Runs invisibly as a background process and records everything in complete hidden mode. Useful for parental control, stealth monitoring of your employee’s, spouse, family members and for various other surveillance purposes. Provide simple and intuitive GUI interface which can be easily handled even by novice users. Log delivery via email – Allows users to regularly receive activity log file at specified E-mail id anywhere in world. Log delivery via FTP server – activity log can be automatically uploaded to Web server using FTP settings defined by user. How to Capture keystroke activities using Advance Keylogger Software? Select 'Internet Activities' from left panel to view report of visited websites, temporary files and cookies. Click on 'Reports' to view and create report of log details either in .txt or .html format. You can also take backup of reports generated by the software. Go to 'Settings' from left panel then click on 'General Settings' to choose ‘Hiding Options’, enable sound recording by setting its size in MB and set time & size of log after that software capture screenshots. You can also change other settings including E-mail Settings, Log Settings, FTP Settings and Security Settings.